Paperback or e-book: which costs more? One of my readers, Wildsubnet, commented that tradpubs (traditional publishers) charging more for Kindle books than for paperbacks might be having an impact. Before I do, though, let me address the situation a bit more. From very early on, people would bring up (in the Amazon Kindle forums, for example), this idea that e-books should cost less than p-books (paperbooks). They often based it on the idea that it didn’t cost a publisher anything to put out an e-book, and that the natural materials cost was less. The first one was based on a couple of ideas that didn’t tend to be true. One was that the publisher already had the e-book rights if they had the p-book rights, which was very often not the case. Another was that all it took was scanning the book if they didn’t already have a digital copy…in reality, the formatting is considerable. It also leaves out royalties for the author for the e-book. The second one assumes that the list price of a book is set primarily to cover the cost of production…specifically, the cost of the “parts”. That’s actually quite a small part of the cost…there are legal costs, marketing, editing, proofreading, cover artist, lay-out, and so on. I can eliminate the second two when I look. I’ll also try to pick just from the Big 5 US trade publishers…although smaller publishers could also be included in the AAP survey. “Diff” compares the Kindle price to the paperback price…a negative number (in parentheses) means that the Kindle book costs more…which is the case in 8 out of 10 here. There are negative savings. In the last column, a bigger number means more savings with the Kindle book compared to the print list price. Every Kindle book is lower than the print list price. Is this the same situation it was in the past? Is it because Amazon can freely discount p-books, but not e-books? Generally, Amazon’s agreements with the biggest publishers are, reportedly, a modified version of the Agency Model. What that means is that Amazon has a limited ability to discount the books. It still shows that the e-book price is “set by the publisher”, at least when I checked. We no longer see a digital price list. My guess is that the publishers are setting the price of the e-books relatively high, but not higher than the list price for paper. Wildsubnet’s comment got me thinking about something else. I would not buy a p-book instead of an e-book, for me to read, if it was just a few dollars different. It is simply so much easier for me to read an e-book…I’d skip the book, in most cases. If you don’t see an answer there that works for you, feel free to let me and my readers know what you think by commenting on this post. reporting on sales figures from the AAP (Association of American Publishers) comparing February 2016 to February 2015, and conclude that e-books were, perhaps, just a fad. Sales of children’s/Young Adult e-books were down 41.7%. E-book market share in that very important segment dropped almost 5%. In the adult trade segment (what you would have bought in a bookstore…not textbooks and such), e-book sales declined more than half again as much as the hardbacks in that segment. Yes, you could think it is all doom and gloomy…and the “only paper books are real books” hardliners could start doing their “I told you so!” dance. I think there are two major contributing factors to these numbers which don’t indicate a decline in people reading e-books. Not even a quarter of the top twenty bestselling Kindle books in the USA are from the biggest traditional publishers. So, even though the AAP got reports from more 1,000 publishers, I doubt that’s anywhere near the majority of e-book published each month. It might not be a decline in e-reading; it might be an artifact of the reporting methodology. My guess is that the “borrows” in those programs aren’t counted…and they probably shouldn’t be, since they aren’t sales. That might be having an impact on the measured sales, if people who would have bought an individual e-book are instead reading some of them through KU and others…that might be an overall increase in e-book reading, although I don’t know that, of course. My McFarland sale bargains are great…thanks, eReaderIQ! Well, it’s been long enough that I’m deep into a couple of the books (I normally read several books concurrently), and I’m very pleased! It’s a listing of science fiction movies released in the USA in the 1950s. So far, I’ve seen almost all of them. From reading the book, I’ve sought out a couple and watched them. Warren does a nice job telling us about the cast and crew outside of this movie, and pointing out trends. That’s what I picture when I think McFarland books: context. I didn’t remember how political some of them are. It was interesting that in one novel, after the rise of Adolf Hitler, the USA and Germany (and others) band together, planning to disarm the rest of the world (Russia especially). Doc works against that…hopefully, Shane Black doesn’t portray Doc as a super patriot like Captain America. That book is $9.99 now, so I saved $6. I have been in a bookstore (not working there…as a customer) and stumbled upon an author signing books. It was an odd experience…I felt like I was intruding, like it was a private party between the author and the fans who went to the store to see them. I did stay and listen, and it was fascinating. the writer describes actively avoiding the table in a similar situation. That’s one thing that’s very hard for some authors…doing the marketing. That is just a very different feel and skill set from writing. Hollywood (which I follow pretty closely) gets a lot of scripts. Some scripts travel around for years, perhaps being loved, but just not getting a deal together for some reason. Movies cost a lot of money to make…the production budgets alone (not counting marketing) can be $200 million. Books, on the other hand, are far cheaper to produce. There company, Adaptive Studios, buy those unattached scripts and turn into books…and if they do well enough, they can then turn the novels into movies. It’s an interesting, round about path…but I’m not convinced they’ll be able to make outstanding movies. That’s never easy, and remember that these scripts were generally already seen as difficult challenges. Healy is the Executive Director (International Relations) of the Copyright Clearance Center. The article looks at how legal copyright changes in some countries can greatly affect publishers (and that affects readers like us, of course). Regular readers know that I’m interested in copyright issues, and write about them from time to time in this blog. I’ll give you a non-book example of a decision about copyright that massively changed an industry…the so-called “Betamax case”, Sony Corp. of America v. Universal City Studios, Inc. In that case, and in a split decision (you can read about it here) it was determined that consumers using video recording devices to “time shift” TV shows was Fair Use (allowed under copyright). If the case had gone the other way (and it was close), you wouldn’t have had the giant home video market which developed. Oh, you might still have been able to buy licensed videos…I had bought Super 8MM three minute movie condensations legally. However, the reason people had recorders in their homes was to record shows, of course…which then meant they had something on which to watch those videocassettes. The article will give you quick looks at some of the issues around the world…I recommend it. Copyright terms: might they get longer…or shorter? Amazon Flex drivers, who are sort of like Uber drivers for Amazon packages, have been asked about an opportunity to deliver a new, secret product from midnight to 2:00 AM this upcoming Sunday (July 31st). First, this does appear to be a physical item, obviously…a digital item wouldn’t require drivers. The hardback is a physical item…that’s hardly a secret, though. Could it be an Amazon device…maybe the rumored color Kindle EBR (E-Book Reader…not with a backlight, like a tablet or a phone)? That is a possibility, although Amazon usually does pre-orders on something like that . They could, though, do a limited, first come , first served sort of thing…maybe limited to Prime members, maybe even only on a limited special offer on Fire devices. If that group was sort of like a “beta” group, seen as doing the testing, that might mitigate the bad feeling some people had about the Amazon Echo roll-out, where some customers who ordered it waited months. If it’s a new Amazon device, I could see it being an augmented or Virtual Reality headset…I’ve speculated about that before. If it tied into Pokémon Go, that could get a lot of publicity. I find it unlikely that it would be an EBR or a tablet…they have had a way of doing those before, and this isn’t it. I would guess it is something technologically complex, that will have a non-Amazon supply chain, where Amazon wants feedback before a general release. Is there a non-Amazon item it could be? I can’t think of anything big enough…hm, Microsoft Hololens? What do you think? What will be this “secret product” (if it reallv happens…intuition is that it will) be? This innovative programsees Amazon act effectively as the bridge between people who own the rights to intellectually property (like a movie, TV show, or book series) and writers who would like to create new stories in those worlds. The rightsholder gets a cut, the author gets a cut, and Amazon gets a cut. The rightsholder is able to put up guidelines, but they don’t approve the individual works. Certainly, you can see how there could be some risk there. There’s nothing that prevents an author from writing a poor story, or one that is distinctly non-canonical (creating a romance between two characters when there isn’t one in the real series, or killing major characters). It’s possible a reader will encounter a KW version first, and then decide not to read the others. I think that’s not very likely, though. I think most people will understand that KW is not official…still, the risk isn’t zero. For Disney, a company famously (some would say overzealously) protective of their characters, I don’t think they’ll tend to take that risk. That’s why, even though the Marvel Universe and Star Wars are amongst the most requested properties, my best guess is that we aren’t going to get those. That additional engagement can have a synergistic effect. Someone who reads a KW work may buy the main series…or another form of licensed content. That happened with me recently…actually, I didn’t even read the KW books, I just noticed they existed. It’s a young adult, post-apocalyptic science fiction series. It’s also a show on the CW. that they had The 100 (from the first episode). It is a bit soapy, and has a cast with a lot of young, traditionally attractive people (in other words, it’s a CW show) ;), but I’ve found that it’s worth watching. There have been some good set pieces, and it has a complex (but not convoluted or overly mythologized) plot. It’s also well designed for binging, with one episode flowing nicely into the next. I’m pretty sure I wouldn’t have started watching it if I didn’t know it was in KW, which gave it a certain amount of legitimacy. and when I did that, I could see there was some significant fandom. I typically add links to streaming and public library searches for non-public domain works like this, a link to a Twitter search, Google news search, and so on. Some have a lot; some don’t. I certainly put things in TMCGTT that don’t have much: those are fun, too! Now, the obvious question: did this get me to read the Kass Morgan books? In an exception for books published by Amazon, even the KW books aren’t in Kindle Unlimited…probably, that would complicate things with the rightsholders. Regardless, it worked: KW got me to view the TV series…and somebody got paid for that. That’s why I still think we may see some older properties that are harder to monetize: The Addams Family, Get Smart, Lost in Space…I might write in any of those, among many others. Maybe with the new Doc Savage movie starring Dwayne “The Rock” Johnson, we’ll get that…but they might be too protective and there is a currently licensed book series happening already. I think it helps a fictional property to be open to new ideas. Superman wouldn’t fly if it wasn’t that the Fleischers requested it, to make it easier to animate in an old cartoon series (when Supes could “leap tall buildings in a single bound”, they had to show take-off and landing, and, well, it’s more dramatic if Superman can hover and change directions). What do you think? Are you reading Kindle Worlds? Has that inspired you to read/view the original property…or discouraged you from doing it? Feel free to tell me and my readers what you think by commenting on this post. While it is putatively about comic books, and most of the press coverage will be about movies and TV, the annual “extravaFANza” (so to speak) also has events specific to books. I’m not going to be there (I’ve never been to an SDCC, although I’ve been to other cons), but I thought I’d list a few of the book-related highlights for people who are…or who are just interested. I’m going to give you first a more detailed listing for today (since you might not have much time to plan if you are there), then just list some topics. How Old is Young Adult in Europe and the USA? Two four letter words with double vowels and ending in “K”? Book and geek! Amazon no longer does the “New and Popular” search as a default, but does “Featured”. Presumably, a human being picks those titles in some way…and the list is clearly not the same. This month, continuing last month’s trend, Kindle First books aren’t dominating the top slots..
June is a big release month for books (not unlike movies)…summer vacation is here, and books for “grads and Dads” are also big. Feel free to suggest other books being released in August in the USA Kindle store. If you are the author, or are otherwise connected with the production or publishing of the book, I’d appreciate you saying so. That won’t stop me from publishing the comment, but it should be in your own words and not an ad. One of my favorite things I own is a rustic “magazinecase”. 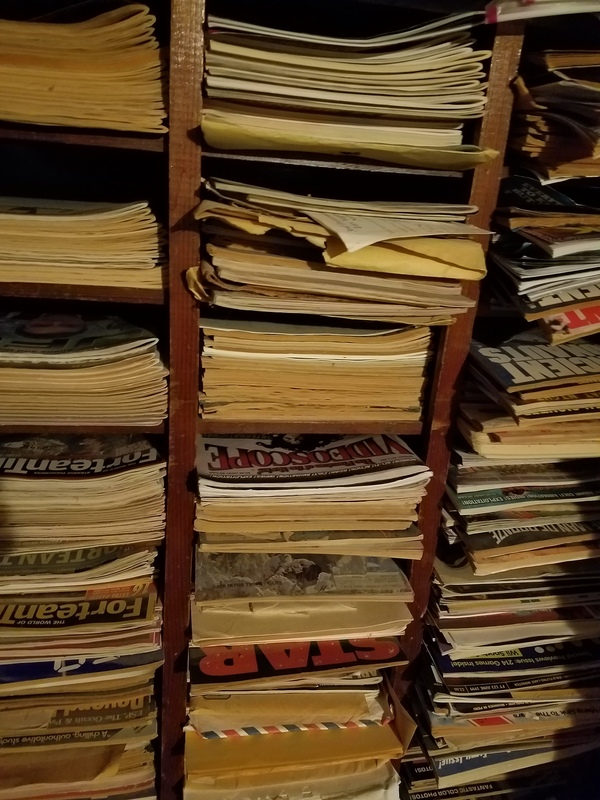 It holds a lot of my old issues of magazines. As I recall, I bought it for $5 from some place going out of business decades ago. As you can see, it isn’t fancy…but it’s a place for me to organize my magazines. That’s a problem with magazines: organization. Some times, I just want to find one particular story I remember reading a long time ago. There was a great interview with David Bowie that I recall. I don’t even remember which magazine it was in for sure. There are books that collect old magazine stories and articles…and it’s like archaeologists uncovering a lost tomb. and I’m trying to tag them in such a way that people can find stories…but that’s going to be imperfect. can get you a full-sized book so easily. Well, with this new Single Classics, it brings us two things. I recognize some of the articles. These are going to be great when you are waiting for something, or at lunch, or with text-to-speech in the car (I checked, and what I checked was not blocked…of course, you might miss some pictures that way). That’s yet another reason to consider KU, Amazon’s subser (subscription service). You can read books (including well-known ones), listen to audiobooks, and now read these articles and stories. I don’t know what Amazon is paying for this, but it’s also going to help them by providing that enticement for KU (which I think will make people more loyal Amazon customers…if that’s possible) 😉 and will count as the ten you can have out at a time. It may mean that Amazon pays less in royalties, while customers still feel they are getting a benefit. I’m also not surprised that rightsholders got on board! It’s a new revenue stream for something which I’m sure is hard to monetize. What do you think? Does this interest you at all? Will you pay ninety-nine cents for one of these? Would you use it to write school papers? Is it going to get you to try the free trial of KU? How much of your reading is short form which didn’t originate on the internet? Feel free to tell me and my readers what you think by commenting on this post. Way back in 2007 when the Kindle was first released (at a price of about $400), people were wondering if Amazon would give away a Kindle with some kind of purchase of books. It’s primarily an all you can read magazine service, with over 175 magazines, including many of the best known ones (People, Entertainment Weekly, Forbes, Essence, Rolling Stone, Vegetarian Times…). These are not going to work on a Kindle EBR (E-Book Reader), but would work on the Fire tablet you would get with it. Six months is $89.95…if you don’t cancel, there will be an automatic renewal. Purchase and activate a qualifying 6-month subscription to Texture Premium on Amazon.com. If you do not cancel your 6-month Texture Premium subscription in the 7 day period following your purchase, you will receive a promotional code via email directly from Texture approximately 8 days after your purchase. Customers who cancel their subscriptions within 7 days of purchase are not eligible to receive the promotional code. Important: You must have activated your subscription to receive your promotional code. Add a Fire 7″ tablet with Special Offers (either 8 GB or 16 GB) to your order by selecting “1” in the “Qty” dropdown on the product information page when adding to your Shopping Cart. Select options on the configuration page and click “Add to Cart.” Add your promotional code at checkout and a discount in the amount of one free Fire tablet with Special Offers will be applied. This is while supplies last, and I don’t know how long the deal will be available. I’m guessing this is USA only.